Libya has six immediate neighbours (clockwise): Egypt, Sudan, Chad, Niger, Algeria, and Tunisia. Its land boundaries total 4,348 kilometres: Egypt (1,115 kilometres), Chad (1,055 kilometres), Algeria (982 kilometres), Sudan (383 kilometres), Niger (354 kilometres), and Tunisia (459 kilometres). Libya’s Mediterranean coastline is 1,770 kilometres long. The island state of Malta and Italy can be considered important ‘indirect’ neighbours. 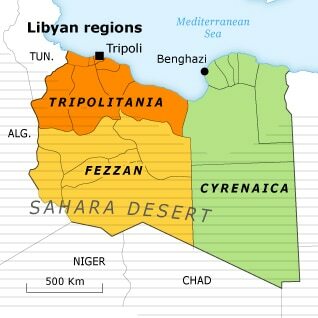 Libya can be divided into three regions: (west) Tripolitania, with the capital, Tripoli; (east) Cyrenaica (Barqa, in Arabic), with its main city of Benghazi; and (south) Fezzan with its main city of Sabha. 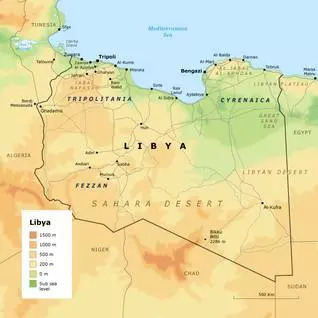 The map of Libya demonstrates the defining feature of the country: the long, open coastline with no natural geographical barriers on land except for the Sahara Desert. The Sahara, which occupies most of the country, is the dominant geographical feature. Narrow strips of fertile land along the western and eastern coasts contain most of the human population. Tripolitania’s coastal region is the country’s most densely populated and urbanized area. On the north-west side, the Jifara plain stretches towards Tunisia and the city of Khoms at the coastal end of the Jebel Tarhuna. In Cyrenaica, the spine of the region is the limestone plateau of Jebel Akhdar (Green Mountain range), which reaches an elevation of 865 metres. It has Libya’s highest rainfall (about 600 millimetres a year) and contains the only remnants of forest. There is also settled agriculture, with the cultivation of fruits and grains. The region is cut by several wadis in the north, and it merges into the desert in the south. Between these is the desert coast of the Gulf of Sirte. This contains the lowest part of Libya, including a ribbon of oases: Sahabi, Awjila, Jalo, Jaghbub, and the lowest point in Libya, the salt lake of Sabkhat Ghuzayyil (47 metres below sea level), south-east of Brega, near the coast. Inland, a series of hills, steppes, and escarpments melt into the semi-desert and then the desert itself. The largest part of Libya consists of hamadas, flat or undulating rocky plains and sand dunes. The Hamada al-Hamra stretches from west of Tripoli, south of the Jifara plain, to northern Fezzan. The historic caravan city of Ghadames lies to the south-west. The largest areas of dunes are the sand seas of Calanscio (Kalanshiyu) in eastern Libya, Rebiana (Ramlat Rabyana) in the south-east, and Murzuq and Ubari in the south-west. In the northern part of the country there are the Jebel Akhdar area (Green Mountain range) in the north-west, and the Jebel Nafusa area in the east, which forms the southern boundary of the Jifara plain (also known as al-Jebel al-Gharbi: the Western Mountain). These volcanic remnants, 600–1,000 metres high, capture significant rainfall, creating a fertile environment for cultivation, particularly of olives. In the south-west there is the massif of the Acasus Mountains (Tadrart Acacus, in Berber), in Fezzan, near Ghat on the Algerian border. It is a region of more than 250 square kilometres, with an extraordinary variety of desert scenery: dunes, isolated stone towers emerging from the sand that have been eroded into strange shapes, rock arches, and canyons that were the beds of ancient rivers. This was once a wet region and contains a rich store of rock art and inscriptions dating to between 12,000 BCE and 100 CE and a large quantity of ceramics and stone tools. It was named a World Heritage Site in 1985. The highest mountains in Libya are the Bikku Bitti (2,266 metres), on a spur of the Tibesti Mountains in far southern Libya, an extremely inaccessible area near the Chad border and the isolated Jebel Uweinat (1,934 metres) in the extreme south-east, on the border with Egypt and Sudan. There are no permanent rivers, but the many wadis in northern Libya carry water intermittently, following infrequent heavy rains. Cultivation is limited to the coastal strips and is sparse. Less than 2 percent of the land is arable. Extensive aquifers underlie the Sahara (see Natural resources). 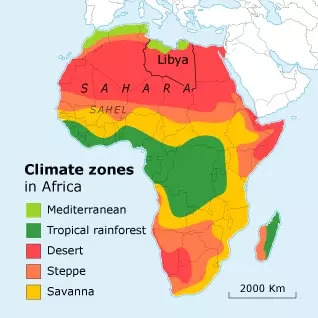 The Mediterranean and the Sahara together have a large influence on the climate. The Greek historian Herodotus wrote, in the 5th century BCE: ‘In the higher parts of Libya it is always summer’, and this is still true. Along the coast there is a Mediterranean climate with hot summers and mild winters. 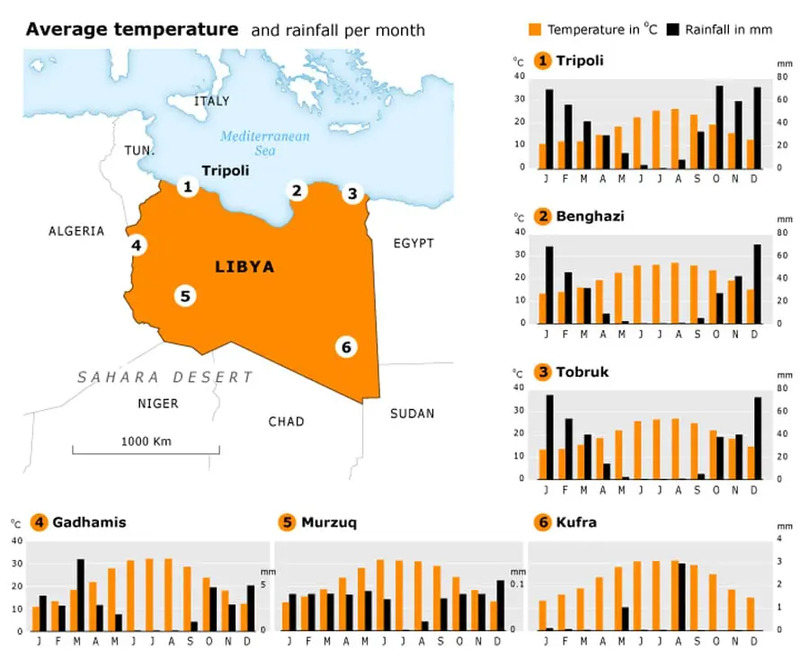 Tripoli has an average winter temperature of 14 °C. In early summer temperatures reach 30 °C, with high humidity. In July and August the temperature can reach 40 °C. From October till March, rain falls along the coast. The highlands, such as Jebel Nafusa and Jebel Akhdar, are generally cooler. In winter, the temperatures sometimes fall below freezing. Snow falls occasionally; Jebel Nafusa was snow-covered in 1994. In the interior, the climate becomes dryer, and the desert is extremely arid. Temperatures can reach 50 °C in summer, and nighttime temperatures drop drastically. On the coast, the wind usually blows from the north-east or north, hot in summer and colder in winter. In spring and fall, a hot, dry, dust-laden wind called ghibli blows over the country. This south wind lasts from one to four days, and the dust storms and sandstorms it raises often affect the countries north of the Mediterranean. 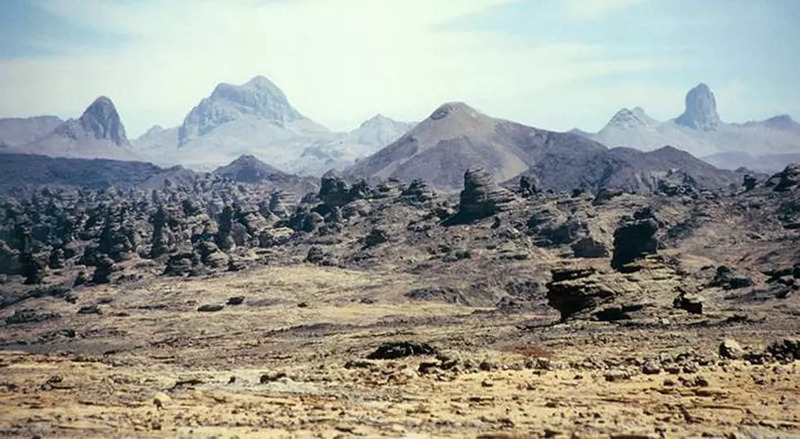 The winds have eroded the Libyan mountain ranges, as exemplified in the Tibesti Mountains. The coastal regions of Tripolitania and Cyrenaica have typical Mediterranean vegetation. Large areas are used for the cultivation of olives and citrus trees. The eucalyptus, oleander, and bougainvillea are often seen. The vegetation in oases consists of date palms, fig trees, tamarinds, and oleanders, and acacias predominate in the desert. The most often sighted animal in the desert is the camel (dromedary). 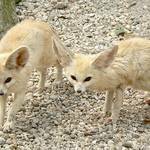 Gazelles, desert foxes (fennecs), salamanders, snakes, and scorpions can be found in remote regions. A goat-like antelope, the waddan, is rarely sighted. Libya is popular among bird lovers as it is a migratory route for among others flamingos. Species include the falcon, desert starling, Egyptian vulture, falconet, lark, crow, turtledove, and song thrush. The 2003 Red List of Threatened Animals of the International Union for the Conservation of Nature (IUCN) rates the addax, Grobben’s gerbil, the Mediterranean monk seal, and the sand gerbil as ‘critically endangered’. Classified as ‘endangered’ are the Dama gazelle, the four-toed jerboa, and the slender-horned gazelle. ‘Vulnerable’ are Barbary sheep, the cheetah, the Dorcas gazelle, and Mehely’s horseshoe bat. In the past there was a much wider diversity of fauna, but many species are now extinct. Barbary lions seem to have vanished in the 18th century. Cheetahs probably became extinct in Libya in the late 20th century; the last observation of a cheetah in Libya was in 1980, on the south-western border with Algeria, where cheetahs are still known to exist. 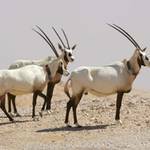 The Bubal hartebeest probably became extinct in Libya in the 20th century, as did the scimitar oryx. The Libya continental shelf has a diminished stock of plankton that are needed to sustain extensive fish populations. 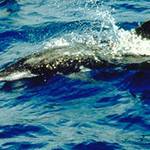 Tuna is the most important fish; others include mackerel, amberjack, wahoo, and shark. There are sponge fisheries off the Tripolitanian coast. Rainfall is scarce, making water supply an important issue. Less than 2 percent of the country receives enough precipitation for permanent agriculture, most of it in Jebel Akhdar. The country’s twenty permanent lakes consist of brackish or salt water. Ten thousand years ago, when rainfall was abundant, the Sahara was richly vegetated with forests, bushes, and savannah grasses and had a rich fauna. All over the Sahara, rock paintings show lions, rhinoceros, hippopotamus, elephants, giraffes, and crocodiles, which attest to the wetter climate and rich wildlife of former times. Roman mosaics picture addax, the scimitar-horned oryx, and the hartebeest. The Romans may have exterminated many large mammals by taking them in huge quantities to Rome to be killed in public arenas. In 6,000 BCE the Sahara began to dry up, resulting in the disappearance of all permanent rivers. Since then, the only permanent freshwater source for Libya has been its underground fossil reserves, dating back to the Mesozoic. The climate became milder during the northern European ice age, and abundant precipitation filled the basins. Radiocarbon research dates these reserves to between 14,000 and 38,000 years ago. Smaller reserves go back 7,000 years. The Nubian Sandstone aquifer is the largest fossil-water aquifer system in the world. It covers some two million square kilometres beneath Chad, Egypt, Libya, and Sudan, and it is estimated that its reserves are around 375,000 cubic kilometres, but, because it is fossil water, it is non-renewable. A major project, the Great Man-Made River, was begun in 1984 and completed in 1996, with the aim of carrying water from these desert aquifers via 2,400 kilometres of pipelines to Tripoli and Benghazi and to irrigate the eastern desert (see Land fertility). 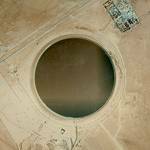 This has dramatically lowered the water table, and increased water demand has forced the government to use desalination. Libya has high-quality gas and oil reserves. 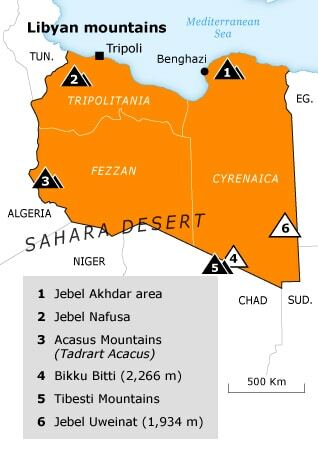 They are located in five major onshore sedimentary basins: the Sirte Basin, the Murzuq Basin, the Kufra Basin, the Ghadames Basin, and the Cyrenaica Platform. Three of these, the Sirte, Ghadames, and Murzuq, together with the offshore Tripolitanian basin, are the main oil producing basins of Libya. The Sirte Basin, the largest, is ranked 13th among the world’s petroleum basins. The first oil reserves were found in 1959 near Zaltan (in Barqa). 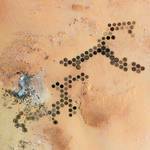 So far, no commercial discoveries of oil have been made in the Kufra basin. 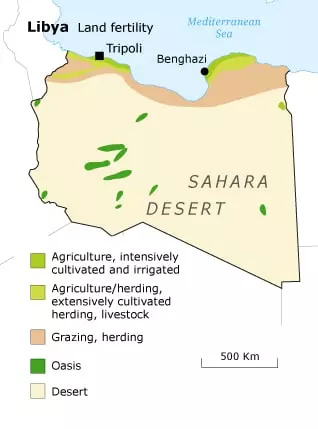 Libya’s infertile soil is also rich in other natural resources, such as iron ore, gypsum, limestone, salt, phosphate rock, barite/celestite, sodium carbonate, and sulphur. Some of these minerals are present in quantities too small for commercially profitable exploitation, although there is a small-scale iron-ore mining at Sabha, and there are salt mines on the coast near the Benghazi coast and east of Tripoli, at Mellaha, which yield 30,000 tonnes per year. There are other reserves of salt near Ghat, Idri, and Marada. There is also small-scale production of gypsum. Less than 2 percent of the country is suitable for permanent agriculture. Other figures estimate that 1 percent is arable and only 0.2 percent suitable for permanent crops. 4,700 square kilometres were under irrigation in 2013. Agriculture is severely limited by the very low precipitation and the lack of flowing rivers. Libya is not self-sufficient in food. Less than 5,000 square kilometres is irrigated, the majority of agricultural land being located near the coast and the highlands. Among Libya’s agricultural products are barley, olives, citrus fruits such as tangerines and lemons, vegetables, wheat, dates, apples, figs, and almonds. The majority of agricultural lands near Tripoli cultivate barley. Many farms have orchards. Beekeeping used to be a family enterprise: hives were kept in inaccessible caves because of their value. In oases, mainly millet is cultivated. Cultivation of vegetables is restricted to irrigated land. An increasing demand for tobacco caused the Gaddafi government to stimulate the cultivation of tobacco plants. Desertification is the principal threat. Animal husbandry is the most important agricultural activity and depends to a large extent on subsidized imports of fodder. In earlier times, goats, sheep, and camels were the primary source of income for the desert nomads. Nowadays, the main signs of a nomad’s wealth are four-wheel-drive vehicles, satellite phones, and cash. Nomadic or caravan traffic has become negligible. Herds of goats and camels are still a common sight, but they are decreasing, while the numbers of sheep, cows, and chickens are growing. Oil wealth has not changed this. Production of barley fell from 116,000 tonnes in 1960 to 98,000 in 2012, beef from 15 billion tonnes in 1996 to 5 billion in 2012, and olive oil from 18 billion in 1964 to 15 billion in 2012. In 1966 Occidental Oil Company received an oil concession in the Sirte basin, on the condition that 5 percent of its profit be invested in the search for water and the development of agricultural projects. Ten thousand hectares of desert were irrigated with underground water; rotating sprinkler installations irrigated the sandy ground for the cultivation of fodder and grains in order to raise sheep locally rather than importing them from Australia. Groundwater levels subsequently decreased dramatically. 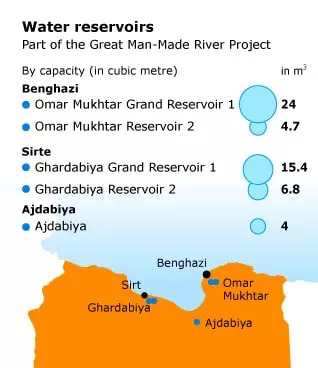 Figures from 2000 show that Libya’s primary agricultural water source is the Great Man-Made River project. Of the total annual freshwater withdrawal of 4.27 cubic kilometres, 83 percent is used for agriculture, 3 percent for industry, and 14 percent for domestic use. Only 0.6 cubic kilometres is renewable. Per capita use is 730 cubic metres of water. Gaddafi initiated the project in 1983, in order to create massive irrigation and decreasing dependence on food imports. Costing USD 20 billion, it required 4,000 kilometres of pre-stressed concrete pipeline, 4 metres in diameter and buried to limit evaporation, as well as wells, pumping stations, water-treatment facilities, and storage reservoirs. The intent was to deliver more than 6.5 million tonnes of water daily to the agricultural, industrial, and urban areas of Libya. To connect the sources of Sarir and Tazirbu with Sirte and Benghazi. To link the Murzuq basin with Tripoli and the Jifara plain. To link the Kufra basin with the Tazirbu line. To link Jaghbub to Tobruk, and Ghadames to Zuwara. Stages 3 and 4 were not completed, but 1,116 of the 1,300 wells that were planned are operational. Large-scale irrigation proved unachievable, but the water supplied an estimated 70 percent of Libya’s urban drinking-water demand. The project’s website stated in 2007 (www.gmmra.org, currently no data available) that two million cubic kilometres of water was transported each day. 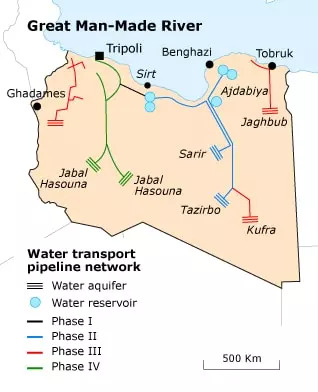 The groundwater table in Libya’s north-western region sank each year, resulting in the intrusion of saltwater into coastal freshwater resources. Falling water tables affected groundwater levels in Egypt and Sudan, causing occasional disputes with neighbouring governments. 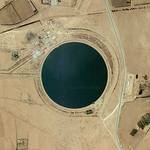 The main reservoirs are Ajdabiya (4,000,000 cubic metres), Umar al Mukhtar Reservoir (4,700,000 cubic metres), Omar Mukhtar Grand Reservoir (24,000,000 cubic metres), Ghurdabiya Reservoir (6,800,000 cubic metres), and Ghardabiya Grand Reservoir (15,400,000 cubic metres). Before 1969 Libya had no national parks or protected areas. In the 1970s the government began to designate national parks and nature reserves. By 2009 sixth national parks, four nature reserves, and at least fifteen protected areas had been established, most of them along the coast. This represented only a small fraction of the total area of the country (the figure for 2005 was 2,207 square kilometres of a total 1.759 million square kilometres, or less than 2 percent of the total land-surface of the country). There are sixth national parks: Abughilan National Park; Karabolli (al-Gharabolli) National Park (Tripolitania, designated 1992); al-Kouf (al-Kuf) National Park (Cyrenaica, designated 1979); Rajma National Park (Tripolitania proposed); al-Naggaza National Park (Tripolitania, proposed); and Surman National Park; and four nature reserves: Benghazi Nature Reserve (Cyrenaica, proposed); Tripoli Nature Reserve (Tripolitania, 1978); Zellaf Nature Reserve (Fezzan, 1978); and Bier Ayyad Nature Reserve (Tripolitania, 1976). 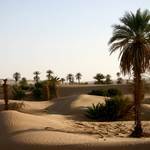 There are fifteen protected areas – five in Cyrenaica (Sarir Protected Area, Jalo Protected Area, Ajdabiya Marsh Protected Area, Sebkha al-Sahel Protected Area, Ain Zayanah Protected Area), six in Fezzan (Jaghbub Protected Area, Oasis of Ghat Protected Area, Kufra Oasis Protected Area, Ouau en Namu Lakes Protected Area, Tazirbu Protected Area), and four in Tripolitania (Nafusa Protected Area, al-Karabolli Protected Area, Wadi Kham Protected Area, Qaminis and Tukrah Salines Protected Area). A list of nature parks and reserves in Libya is available here. There is more information on each area here. Nature protection and conservation never had priority in terms of staff and costs, but Libya is party to international environmental agreements on biodiversity, climate change, the Kyoto protocol, desertification, endangered species, hazardous wastes, marine dumping, ozone-layer protection, maritime pollution, and wetlands. Libya has signed but has yet to ratify the United Nations Convention on the Law of the Sea. There are five Libyan sites in the list of UNESCO World Heritage Sites: Archaeological Site of Cyrene (1982); Archaeological Site of Leptis Magna (1982); Archaeological Site of Sabratha (1982); Rock-Art Sites of Tadrart Acacus (1985); Old Town of Ghadames (1986). Environmental issues are yet to become important in the Libyan society and economy but are likely to grow in importance, as the salinization of soils increases and increasing waste due to growing population forces urban areas to respond. Libya is party to several environmental protection initiatives and treaties. It is a signatory to the Barcelona Convention, which aims to protect the marine environment and the Mediterranean coast. Libya has ratified the Convention for the Protection of the Mediterranean against pollution but not the amended Convention nor its protocols. According to data from Libya’s Energy and Environment Data Reference Bank (2008), the country emitted 59.4 million tonnes of CO2 in 2004. Emissions of CO2 were growing at a rate of 4.2 percent per year between 1990 and 2004. Libyan CO2 emissions continue to grow but remain low in terms of per capita emissions: 9.3 tonnes per capita in 2004, compared with 13.2 in high‐income OECD countries and the 4.5 tonnes per capita average in Arab countries. Libya’s oil sector contributes approximately 70.5 percent of the country’s CO2 emissions, while the natural-gas sector contributes 29.5 percent. Libya’s primary agricultural water source remains the Great Man-Made River Project. Of the total annual freshwater withdrawal of 4.27 cubic kilometres, 83 percent is used for agriculture, 14 percent for domestic use, and 3 percent for industry. Only 0.6 cubic kilometres is renewable. Annual per capita use is 730 cubic kilometres (see also Land fertility).